This restaurant specialising in soup filled dumplings is already incredibly popular and has people lining up out the door. And with good reason - these are the best we've ever eaten. 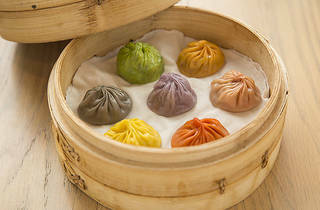 Established in Taiwan in 1958 by cooking oil trader Bingyi Yang and his wife, Din Tai Fung's dumplings became so popular at their first little store they soon found themselves opening in Japan, Korea, Indonesia, the US (in 1993, the restaurant was rated as one of the world's ten best by the New York Times). And now, right here in Sydders. Why so good? Silky, gossamer-thin skins hold a tiny mouthful of soup, so when you pick them up with chopsticks they wobble provocatively. Eating these pockets of lava-hot deliciousness can be perilous­ - pop the whole thing in your mouth and you'll burn the skin off your cheeks, bite it the wrong way and you'll cover the table in hot pork stock. The trick here is to take a delicate bite from the top, then drink the soup out of the dumpling. Most important is that you eat it while it's hot for maximum flavour and texture. So, how exactly do they get the soup in the dumpling? No, an elephant doesn't sit on them - gelatinised pork stock is chopped into cubes and lightly worked into the minced-meat filling. When the dumpling is steamed, the stock leaves its solidified state and fills the bottom of the dumpling with soup. The dumplings are then steamed over rounds of white cotton to stop them sticking to the bamboo steamer. The process itself is an event - dozens of bamboo steamers are placed on a long, dazzlingly silver hotplate tended by bustling chefs in white chef coats and face-masks as well as huge glass windows in front of the hotplates - so you're right there in the action whether you're waiting outside (as is likely if you haven't booked a table) or eating in the restaurant. The room itself is all very pared back, highly styled with clean, bleached wood lines and a whole wall decorated in bamboo steamers in every size imaginable. If you're waiting for a table it'll give you a few minutes to tick what you want on the ordering sheet from the huge menu. It's not exactly foolproof though - you still might find yourself with bowls of hand-cut chicken noodles instead of the fried rice with chicken chop but they fix any hiccups with lightning speed. The fried rice, by the by, is great - buttery, salty with little pops of sweet corn kernels, peppery green onion, enriched with ribbons of omelette with crunchy, deep fried chicken pieces on the side. There's also an excellent vinegary cucumber salad riddled with chilli and super-garlicky stir-fried water spinach. But while there's plenty of other goodness on the menu, the dumplings are king. 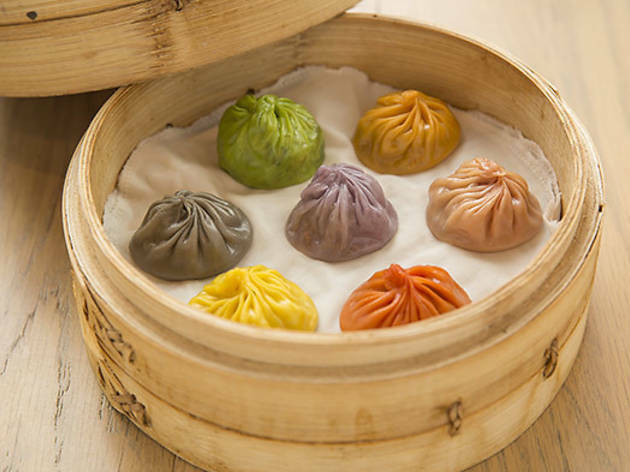 Sydney’s demand for theses silky morsels has become so great that they now have dumpling houses in Chatswood, Chippendale, North Sydney, Pyrmont and Chinatown.